FLAG is a collection of artists residing in either Langley City or the Township of Langley who are dedicated to their own art and to the promotion of the arts in their community. Goals Within FLAG - Members share ideas, visions, and opinions; members request feedback and provide support for each other. We learn together and value the inspirations and insights offered within the group. We provide members with creative and artistic connections. Members present regular Exhibitions, Painting On-Site, and Special Theme-Based Shows at the FLAGstop Gallery located in the Langley Heritage Society CN Train Station in Fort Langley. Goals Outside FLAG - Members work to promote the Arts within our community. We are involved in large and small collective events that promote not only Fort Langley, but the Township of Langley as a community that embraces the Arts. Our artists specialize in watercolour, oils, acrylics, pastel, drawing, clay, sculpture, mixed media, glass jewellry, and photography (black and white and colour). Subject matter varies from contemporary to classical; some artists prefer portraiture, others landscape - the choice is endless. FLAG is non-profit and self-supporting. 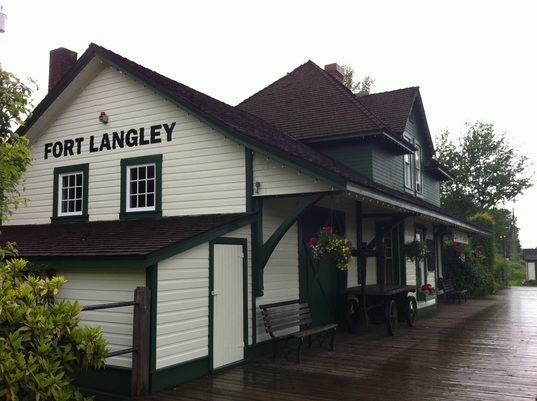 FLAGstop Gallery is in the Langley Heritage Society CN Station, at the corner of Mavis and Glover Road, Fort Langley, British Columbia, Canada. OPEN weekends May to September noon to 4:00 pm ​or by appointment. Fort Langley, in the Township of Langley, is conveniently located near the #1 Hwy (take the 232nd Street exit North). This historical site is about a 50 minute drive from Vancouver, 20 to 30 minutes from the USA border using either Peace Arch or the Aldergrove crossings. Each artist may be contacted by telephone or e-mail year round. See Artists List on home page menu.